I don’t know exactly if with the time I become pickier or if the movie industry isn’t anymore what it used to be, but lately it seems that are fewer and fewer movies that make a strong print in my memory. In the recent years one such movie was “El Laberinto del Fauno” (“Pan’s Labyrinth”) and the director, Guillermo del Toro, definitely caught my eye. Seeing his name on the presentation of “El Orfanato” (“The Orphanage”), as producer, was another reason for my desire to see this movie (but not the only one). After many years, Laura returns to the place of her childhood, the orphanage where she lived for a while. She returns together with her husband and her adopted child, Simón, and she intends to make the place a home for children with disabilities. But on the day of the house presentation and the children’s party her son disappears. Her search for her missing child will face Laura with her childhood memories and old ghosts. 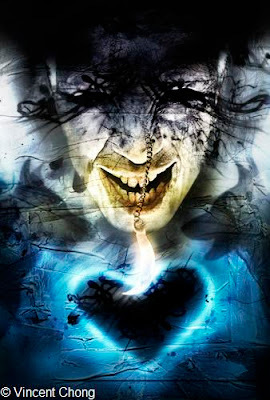 “El Orfanato” is a horror movie and when it comes to this genre it doesn’t bring anything new on the screen. The classical theme of ghosts and of a haunted place is old and used constantly every year. But this movie is unique in its making, the work made by the crew, the setting and the atmosphere make “El Orfanato” one of the best horror movies and one that beats the vast majority of ghost movies. What I really liked in the first place is the setting. The landscapes are absolutely lovely, the house looks really good and contributes in full to the general atmosphere. I know that in the most of its parts the movie was filmed indoors and on a studio setting, but those outside images were very beautiful. I also liked that little game played in the movie, of treasure hunting. All that excitement behind the child’s play, the rush from one clue to another, the wish which will be granted at the end of the game, reminded me of childhood and the innocence of that period in everybody’s life. Like I said the story is classic, simple, but it is well constructed, with the tension well built, driven to the higher point steadily and constantly. The end, more exactly the explanation for the Simón’s disappearance, is very good, one that I didn’t think of and didn’t imagine it. It is a simple idea, but that makes it more powerful. But “El Orfanato” doesn’t fall in the general horror line. The tension and the thrill is more on the psychological and emotional level and you will not get grotesque and frightful scenes. But I believe that this makes the movie more powerful. What I love the most at “El Orfanato” is Belén Rueda’s interpretation. She makes a powerful role and makes from Laura such a strong character. Because of her interpretation I sympathized with the character much more and I was much more involved in the story. She is a very good actress and definitely shows great talent. I will add to this the Geraldine Chaplin’s appearance, short, but powerful. Although Guillermo del Toro is only the producer of this movie he associates with a good title again and “El Orfanato” is a very interesting movie and one that made a print on my memory. - "Arrowhead" by Paul Kane (through the courtesy of Abaddon Books). Thank you very much for these wonderful treasures. It appears that this year Trick or Treat has already produce a Halloween goodie. Douglas Clegg has one very nice Halloween treat for us, a free reading of his novel, "Afterlife". 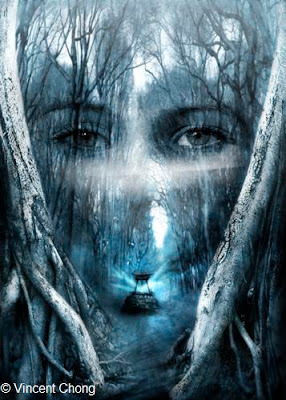 "Afterlife" is a gothic thriller about Julie Hutchinson, a woman driven to the edge of sanity when a brutal murder ignites a series of psychic invasions at her home. Now although I don't like e-books too much (actually at all) I couldn't pass such an interesting offer. You can find the link to Douglas Clegg's "Afterlife" at his webiste along with other interesting information. It looks like this week is dedicated to the cover art. 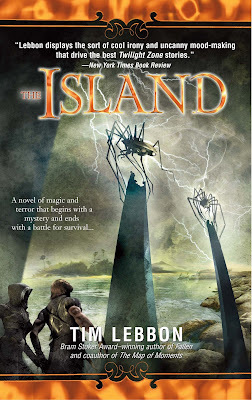 At Tim Lebbon’s website I found the cover for his upcoming novel, “The Island”. 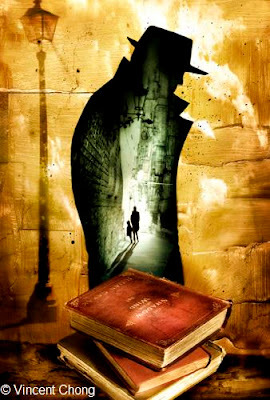 Unfortunately I don’t know who the artist is and what the novel is about. But the cover looks pretty interesting and it is quite catchy. As for the novel, I will be definitely interested in it because my last encounters with Tim Lebbon’s works were very pleasant and entertaining. “The Island” is out next year on May, from Bantam Spectra. I already marked this day on the calendar, like many other days of the next year. Uwe Jarling is a German artist born in 1968. He graduated with a diploma degree in graphic design in 1991. He worked as an illustrator and graphic designer and among his first works were many covers for videos and books. 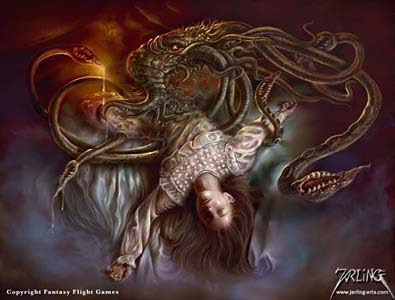 From 2003 his works are made almost totally using the digital tools and they are mainly in the Fantasy genre. His works won several awards from the communities of digital arts. Also some of his works were featured in published collections such as “Exposé” and “Fantasy Art Now”. Uwe lives and works in a little village in the south of Germany. Dark Wolf: Uwe thank you for the opportunity of this interview and for taking the time to answer my questions. What attracted you towards art and do you have a recollection of your first attempt of drawing? Uwe Jarling: Well, I think you’ll get the same answer from every artist out there, something like I drew since I was able to hold a pencil. This may sound like kind of a standard answer but it really is the truth. I can’t remember a time where I wasn’t interested in drawing and painting. I read loads of comics when I was a child and I knew I wanted to do something similar like drawing comics when I grow up. Well I didn’t become a comic artist, but at least I already did some comic covers, so somehow the dream of my childhood came true. Dark Wolf: What made you chose Fantasy as your main working theme? Is it a professional choice or a more personal one? Uwe Jarling: Definitely a personal one, I worked many years as an illustrator without doing any fantasy art, you know video-box illustrations and lots of illustrations for kids, technical stuff and many other things. As this was not what I really wanted to paint I decided to quit doing illustrations like that, took a regular job at an advertising agency which pays the bills and started to paint what I always wanted to – fantasy art. 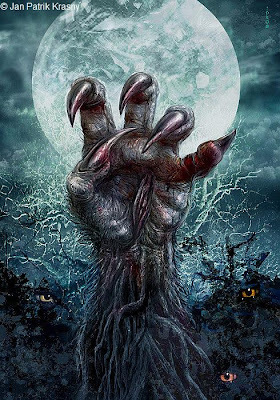 Dark Wolf: I was delighted by a great number of Horror pieces in your portfolio. Is it more engaging to work on a Horror piece than a Fantasy art? Which one do you think that has a more emotional impact on the viewer? 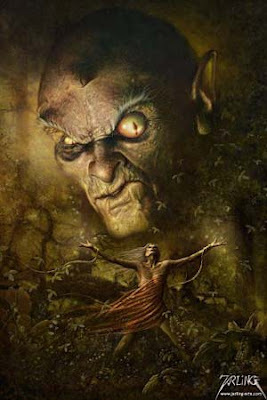 Uwe Jarling: This it always depends on the viewer whether he or she is more into fantasy art or dark art. I for me enjoy doing both, most of my darker pieces are for metal bands, this is much fun to do as you really can go wild with your imagination. DW: Which are the main sources of inspiration? What process suffers the image that inspired you to the finalized work? UJ: To be honest I don’t need much inspiration I have such a lot of pictures in mind that still needs to be done, I just don’t find the time to do them all. DW: I saw some wonderful works on your portfolio which reminded me of Luis Royo’s works. Did Luis Royo or other artists inspire you? Who do you consider to have the greatest influence on your career so far? UJ: Hey glad you liked them :-). But to be true the reason some of my pieces look a little Royo is not cause I try to copy Luis, it more the technique I used to paint them. I don’t really have something like an own style I think, I always love to experiment with other techniques. The pieces you mean are painted in glazes without using much opaque colors, more a colored drawing than a painting, this leads to the Royo effect if you want it to name that way :-). As for the influences, well this wouldn’t make sense to even start to name them as there are just too many. I’m not only a guy drawing fantasy art I love to look at other artists work as well and all of them are most inspiring to me. DW: I’ve seen that rece ntly you worked almost exclusively using the digital tools. What influenced this change and do you think that the digital tools helped you improve your work? Do you prefer the traditional method or the digital one? UJ: Yes today I almost paint everything using the computer, I started to paint on the computer in 2003 or a bit earlier. The main reason to change to digital painting definitely the time aspect. You are faster using digital tools than traditional, not that the painting process itself will be faster but you don’t need drying times, changes can be made much easier and best is, when you are done you just send the finished piece via e-mail or sever upload to your client, this definitely saves a lot of time. Well I remember me saying as soon as I need to earn my money using a computer I quit doing art, well as you see things became very different, as I got my first computer I fell immediately in love with it, it really has endless possibilities for creating art, a very creative tool. I really underestimated the possibility a computer can give you. BUT at the end the artist does the art not the computer, it is just another tool, not more or less than a pencil, just with endless more possibilities. Today I really prefer to work digital than traditional, I don’t have to clean the brushes anymore, lol. DW: You worked for several advertising agencies. Can you tell me please how was working in the advertising field? Do you consider that the freedom of creation in this domain is more restricted than in other domains which use art? UJ: Well, I still work in the advertising industries, just only less people know it, haha. I still have my regular job as an graphic designer in an advertising agency and so my illustration at evenings and weekends. I probably could jump into freelancing again but I’m just to chicken-hearted at the moment, well having a family and kids things become more complicated ;-). Now working in the advertising field sure is different than doing wired fantasy illustrations but at the end you are restricted at by both. In both field you have an art description or a briefing which you have to follow, well the client is the king :-). DW: Your work on many numbers of covers for videos, music, books. Which one of this was more challenging and which one did you enjoyed making the most? UJ: I enjoy everything, really. A video-box sure has other challenges than a book cover or a album cover but all are very interesting to do. I really can’t tell what I like the most. DW: You were awarded in several times for your work. Which one did you receive with more pleasure and which one surprised you the most? Besides these awards which one do you consider to be the most rewarding time in your career? UJ: Well every award or recognition is fantastic I don’t received one with more pleasure than another. Always fantastic when people recognize your work. 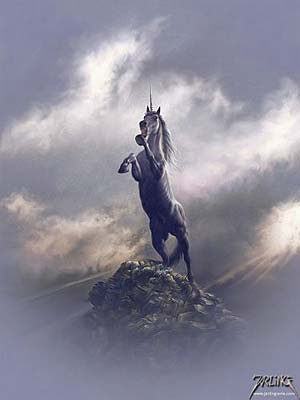 But if a should name a special one it would be the publication in the book “Fantasy Art Now – the very best in contemporary fantasy art & illustration”. Being published in this book together with names like Boris Vallejo, Donato Giancola, J.P. Targete, Matt Stawicki, and many of my artist friends was really cool, especially as it is one of the best fantasy art books in a long time, and I don’t just say that cause I’m in, it’s really a wonderful book filled with pure magic. As for the most rewarding time in my career, well what shall I say currently things went pretty well ;-). DW: I know that you had a personal exhibition featuring your works. What brought new this experience and how different is this exhibition from an online gallery for example? Is the interaction with the visitors and the lovers of your works different? UJ: Sure a real exhibition where you can talk to the people is something completely different than to show your work in an online gallery. It’s definitely cool to have an exhibition but sadly I don’t had much as I just don’t have the time for things like that at the moment. DW: Did you thought about some changes in your career? I mean trying new experiences in your line of work, for example gaming concept art, movie concept art or comics industry? UJ: Well I do from time to time stuff for the gaming industry as well as I do comic covers from time to time. Now I just need to do something for the movie industries (except the video covers), than I would have done something for the whole range :-)). No I don’t think I will change much in the near future as I do very varied jobs anyway. The only thing I really want to do more in future is to work more with 3d applications and see if I can use that anyhow for my illustrations. DW: What should the fans expect from Uwe Jarling in the future? Do you have any immediate projects in mind? 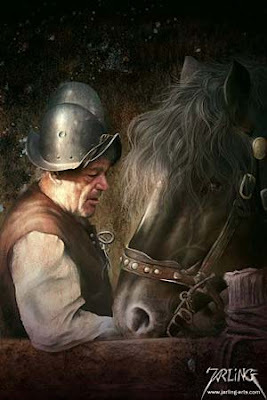 For much more information about Uwe Jarling and for a more extanded portfolio please visit his website, Jarling-arts. You might have noticed that Brian Ruckley’s novel, “Bloodheir”, is on my Currently Reading section for quite a while now. I am sorry for the delay, but I had a new project on my work for the last couple of weeks which occupied a lot of my time and therefore the reading time was shorted even more. But the project is drawing to a close and soon I will get to my regular reading schedule. 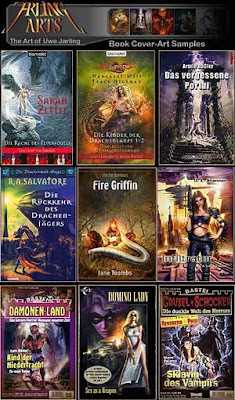 So, I think I will have the review for “Bloodheir” ready next week, I’m still having ¾ of the book to read, and possibly another review, for “Extraordinary Engines” from which I managed to read 5 stories from 12. 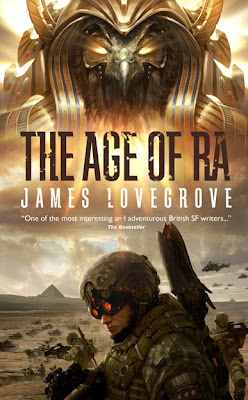 Through the wonderful blog of the Solaris Books editors, When Gravity Fails, I found out about an interesting cover for the James Lovegrove's novel, "The Age of Ra". 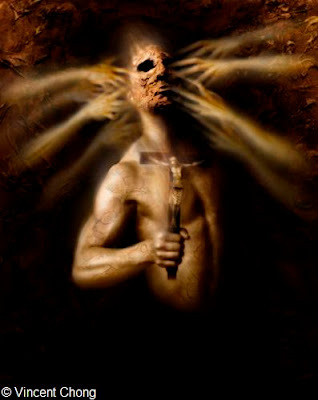 The cover art is made by Marek Okon and it is quite catchy, especially the God figure from the top of the cover. It is true that seeing this cover I thought almost instantly of Stargate, but I read on James Lovegrove's website that his association of military SF and Egyptian Gods has nothing to do with the respective movie and TV series. I have to admit that I didn't see more than 2 or 3 episodes from the TV series, but this cover did stir my interest for the novel, which will be published next summer. Jan Patrik Krasny is a Czech artist. He was born in 1955 and since his childhood he has been attracted by the comics. His followed his passion on the benches of Academy of Fine Arts in Prague, which he graduated in 1982. After 1989 he published comics in several magazines and newspapers. He is a member of the Association of Science Fiction and Fantasy Artists. He was nominated and won several art prizes; Jan Patrik Krasny was nominated on the Czech Academy of Sci-Fi, Fantasy and Horror Award in 1999-2004, he won the European SF Society Award in category Best Artist in 2002 and Czech Academy SFFH Award for the Best Artist in Czech Republic in 2004, 2005 and 2006. 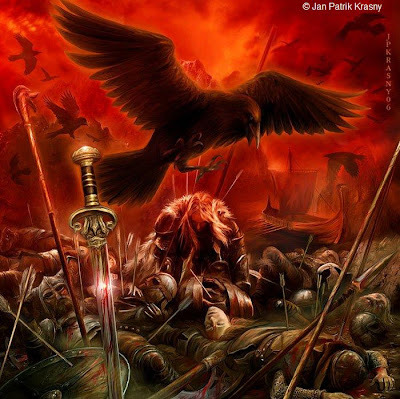 The main works of Jan Patrik Krasny are illustrations and he created hundreds of covers of mainly Fantasy and Sci-Fi books for various Czech publishers. Recently he has been devoted to computer graphics. His works are exhibited in private collections and galleries within the Czech Republic and in abroad. For a more comprehensive portfolio of Jan Patrik Krasny, please visit his website, Krasnyart.eu. "Knowledge is devalued when it becomes too generally known." Thomas M. Disch - "Camp Concentration"
Here are some new books I received in the last weeks, through the amiability of their publishers. Thank you both very much. - "Extraordinary Engines" edited by Nick Gevers (through the courtesy of Solaris Books). Larry from OF Blog of the Fallen came up some time ago with the idea of a Book Club. 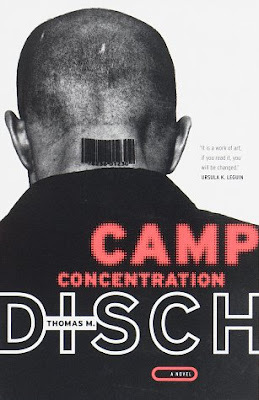 And the first choice for that Book Club was Thomas M. Disch’s novel “Camp Concentration”. Louis Sacchetti, the main character, is imprisoned because he refused the draft. He is serving a sentence of five years, but after a period served in the initial prison he is transferred to Camp Archimedes. This prison, a secret military facility, is run by the General Humphrey Haast who asks Louis Sacchetti to keep a journal with his observations on the prisoners and the prison. “Camp Concentration” is written from the perspective of Louis Sacchetti, a poet and conscientious objector, and storyline is seen through the entries that the main character makes in his journal. For the first part his journal is kept on daily basis, but after the second half of the book the entries are made as paragraphs or numbered entries and this fact contributes to the building of the atmosphere and the condense of events. Through the main character perspective I was introduced to the other characters and the plot of the novel. Camp Archimedes is a secret military base in which the prisoners are the subjects of an experimental research. They are injected with a form syphilis which increases the intelligence of the subjects and makes them brighter. However the side effect of this process causes physical degradation and death within nine months. Thomas M. Disch deals with some of the moral and philosophical issues, such as government secret experiments, the technology development and the sacrifices made for that development and human degradation, the downfall at the hands of scientific progress and religious aspects and considerations. The plot of the novel is set in the first half of the novel, but it is much more built and developed in the second half, which is more interesting also. The novel is written in a more intellectual and philosophical attempt of Thomas M. Disch made in the Science Fiction genre. And because of his approach it didn’t make an easy or enjoyable read. Because of the writing style it was very easy for me to lose focus on the reading and for my mind to concentrate on the novel. As a paradox although I couldn’t focus and concentrate on the novel, the minds of the characters were improved. Beside the writing style the character development is suffering and that because although is told from a first person perspective the main character just relates a series of events. The action and the drama are very much inexistent and these aspects contribute a lot in my lost of concentration. I mean that I don’t read only action packed novels, but at least something must happen to catch my attention and for me to enjoy a novel. I believe that Thomas M. Disch’s “Camp Concentration” will not benefit from a great number of fans, from Science Fiction genre or outside it. And although is an important and valuable novel it is not what I’m looking in a reading. How do you create a space monster? With the launch of the Hyper-Serialized, SF/Horror series, The Deadbooks, PantherRun Productions LLC has a solution. You take one part movie, one part book, one part radio, and toss it into a blender. What pours out is a beast that’s no longer chained to yesterday’s way of thinking. Sandgate Vermont, September 1, 2008. For the last eight years, Hasso Wuerslin has been working on the Hyper-Serialization of his Deadbooks series. What’s a Hyper-serialization? You expose a story to a mash-up of story-telling techniques from such mediums as film, TV, radio, print; a mash-up that could only exist because of the distribution freedom offered by the net. “When you really think about it,” says Wuerslin, “there’s only been one paradigm-busting form of entertainment created thus far for The Net - video games; everything else has been just a port to the computer screen. But the power of The Net is that it doesn’t care how you tell the story; doesn’t care what techniques you combine. It will show whatever you put up. That’s the focus of Deadbooks.com. The 10 hour, 1st season will feature 30 actors, and 40 musical groups from around the world. It will tell the story a mining scout ship, led by the gifted Shallen, who discovers an Earth void of human life... except for the memories of a long dead, Will Lant - memories so powerful that they posses Shallen, revealing to him Lant’s final days; days in which Lant was forced to live the lives of three alternate beings in a desperate attempt to rectify a terrible mistake. Now, like the spider, the ghost of Lant traps all passersby, in the hopes that one can achieve what he could not bring himself to do. 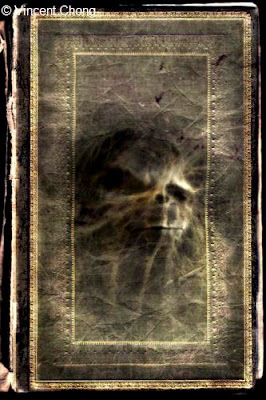 Further information; please visit the website, Deadbooks.com. About: Hasso Wuerslin is owner of PantherRun Productions LLC located in Sandgate Vermont USA. Vincent Chong is a British freelance artist, who graduated a University Graphic Design course in 2003 and whose work have been published and recognized internationally. He has created artwork for books, magazines, websites and CDs and he illustrated the works of authors as Stephen King, Joe Hill, Ray Bradbury, Ramsey Campbell, Clive Barker and Carlos Ruiz Zafón among others. Vincent was awarded with the Arno Art Award for Digital Imaging Professional in 2005 and twice the British Fantasy Society Award for the Best Artist in 2007 and 2008. Among his preferred methods of work is a mix between photography and digital art. Dark Wolf: Vincent thank you very much for this opportunity and your amiability. How did you come in contact with art for the first time? Did you feel attracted by the art in its visual form from the first time? Vincent Chong: I remember that from a very young age I would love to draw, and was encouraged by my parents to do so; I loved cartoons and comics and would draw characters, such as the Ghostbusters or Teenage Mutant Ninja Turtles for my friends at school. It was throughout school that I continued to develop my appreciation for various visual art forms, and my talent in this area. Dark Wolf: Which person or event do you consider to have influenced you the most in your career so far? 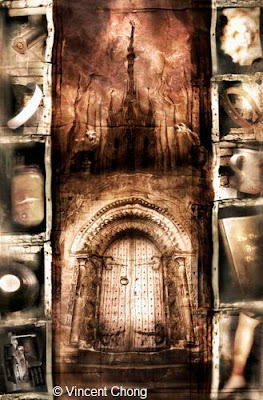 Vincent Chong: I’ve drawn inspiration from many different sources over the years, which I’ve brought to my career, but maybe the most influential moment was when I picked up a copy of Dave McKean’s ‘The Sandman Dust Covers’. I was captivated by his approach to creating imagery and the different techniques he used – combining use of the digital medium with fine art techniques. It opened my eyes to what could be achieved combining the use of different media and set me on the path to developing the style and techniques I use in my work, and even now I’m still inspired by his art. Dark Wolf: You have also a passion and a talent for photography. But where do you like working more on the photography or in the painting? Vincent Chong: When creating my artwork I actually use a combination of techniques – I bring together both photographic and painted elements digitally to create my images, so it’s not so much a matter of which process I like working with more, as they both come into play when creating my artwork. I do however really enjoy the photographic side of things and it’s an area that I may want to explore further in the future and would maybe one day like to do some more straight forward photographic work. DW: Did your passion for photography influence your choices in the painting? I mean sources of influence, materials to work on, tools used? Or it works the other way around, from the painting to photography? VC: I draw inspiration from a wide range of places, so I won’t just look at the work of artists or illustrators but am also influenced by the work of photographers and film-makers and take inspiration from how they might compose their images, or their use of colour and lightning to add drama and emotion to a picture. DW: Would you like to bring a specific technique from photography to painting or from the painting to photography? VC: As mentioned earlier, I use a combination of both photography and painting in my artwork and am inspired by the work of both artists and photographers, so I find that both areas feed into each other anyway when it comes to my work. DW: Working on so many novel covers can be very entertaining and interesting. But do you feel sometimes working on the same pattern or using the same elements? VC: I’ve been lucky enough to have been able to work on a range of different types of novels for various authors, so each project brings new challenges and opportunities to try out different things, even if some similar elements or processes are used in the creation of the imagery. I do enjoy working on different types of projects though and wouldn’t want to ever just limit myself to book covers. For example, I’ve also done artwork for websites and games which had to be animated, which is challenging in a different way as there are other concerns to take into account when creating artwork that is to be animated. DW: The source of inspiration comes exclusively from the respective novel pages or this kind of work involves sharing the thoughts and ideas with the authors or the publishers? VC: It depends… Sometimes a publisher or author will have a specific idea in mind for the cover, in which case I’ll work along those lines. Other times I’m given the manuscript to read and will come up with some ideas and sketches myself, that I will then send to the publisher and/or author for feedback. If they’re not happy with the approach I’ll come up with a different idea for them, otherwise I’ll go straight ahead with creating the final artwork. DW: I’ve seen many of your works on limited edition covers. Does the work on the cover of a limited edition novel differ much from that on the mass production? VC: Usually when I work for smaller independent publishers for limited editions, I have a lot more creative freedom. With jobs for bigger publishers, I’ve found that they’re much more particular about what they want and usually already have an idea in mind for what they’re after. There’s also a lot more people involved who have to approve the artwork, so there may be more revisions involved before the artwork is finalized. DW: I know that I shouldn’t ask you this question, but do you prefer one of your covers in particular? Would you like to make the cover for a particular novel or to work with a particular author? VC: My favourite changes from time to time. At the moment, one of my favourite images that I’ve done recently is ‘Saint Darwin’s Spirituals’ which I did for issue 4 of Murky Depths magazine. I created a pair of steampunk inspired goggles for the image, for which I researched steampunk imagery which I really enjoyed doing – and I was very pleased with how the image came together. At the moment I can’t think of any particular novel or author I’d particularly like to do a cover for. I’ve been fortunate that I’ve already had the chance to illustrate the works of some great authors, one of which is Stephen King, whose work I was a big fan of, growing up, and never thought I’d be illustrating one day. 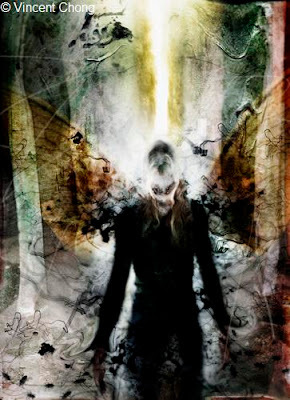 DW: A great number of your covers are made for horror novels. Do you consider that this particular genre is offering the best sources of inspiration and the best material to work with? VC: I do like illustrating this particular genre as I find myself drawn to things with a darker edge, and so I find it easy to draw inspiration from horror novels. However, I’m not as interested in schlock horror, or things that are overly gory just for the sake of being so – I’m much more interested in the psychological and emotional aspects of things. DW: I read on your website that you would like to make collaborations with talented artists, photographers, designers, writers, film-makes, etc. Do you have a specific project in mind? Or would you like to experience our talent in a new field? VC: I don’t have any specific projects in mind. I find it inspiring meeting other creative people, and finding out about their work and working methods. I’d like to meet people who are talented in other areas that I can learn from, so I can push and develop my own work further, and perhaps into different media. I’m always open to the idea of working on a collaborative project if it’s something that excites me – one problem I’ve found though, is finding the time do everything! DW: You are an Award winner of British Fantasy Society Award. When you’ve started your career did you dreamed winning such a prize? How do you feel winning it two times in a row? VC: Going into this career, if was never a main focus of mine to go out and win awards - I was just concentrating on trying to find work and was happy that people were offering me projects to work on. I still feel like I’m relatively new to the industry, so to be recognized for my work by the British Fantasy Society, with these two awards was a great honour for me. I was surprised the first time I won it (I was happy just to have been shortlisted and hadn’t expected to win) and was even more surprised the second time, as I didn’t think I’d win it two years in a row, especially as one of my favourite artists, Dave McKean had also been shortlisted this year. DW: Was your career changed after winning these two awards? VC: I think there might be a few more people out there who may now recognize my name or work after winning the awards, but I don’t think it’s changed my career in a big way. I think it’s been more of a nice acknowledgement of the work I’ve done so far in my career. DW: Is there a specific moment or something throughout your career so far that you would like change if it would be possible? VC: I can’t think of anything specifically that I’d like to change so far. There are always things in projects that I look back on and think I could have done better or differently if I was to do it again, or had more time, but I think that’s just my nature, and I’ll never be 100% satisfied with what I’ve done as nothing’s ever perfect. DW: Which plans do you have for the future? VC: I’d like to continue finding projects that inspire me and that I enjoy doing. So far, the majority of my work has been for book covers, so in the future as well as continuing to do more book cover work I’d also like to branch out more into other areas as well, in particular, doing art and design for cd covers and packaging. It’s something that I’ve done a bit of already that I’ve really enjoyed, but haven’t had the opportunity yet to do as much as I’d like to. Thank you very much for your time and for your answers. It has been a pleasure. For other information and for a complete portfolio please visit Vincent Chong's website, Vincent Chong Art. Solaris Books is offering the chance for one lucky winner to win a time machine (this is not a real working time machine! It is fragile, contains small parts, and is for ornamental use only). This was the very model featured on the splendid cover of Extraordinary Engines, an anthology of top-hole tales edited by that bounder Nick Gevers! Moreover, five runners up will each receive a copy of the aforementioned Steampunk anthology! You can find all the needed details for entering this very interesting competition by following this link. Pat over at Pat's Fantasy Hotlist has two very attractive contests. At the first one the prize is a complete set of the new UK edition of Stephen R. Donaldson's scifi masterpiece, The Gap, which is comprised of "The Real Story", "Forbidden Knowledge", "A Dark and Hungry God Arises", "Chaos and Order" and "This Day All Gods Die". 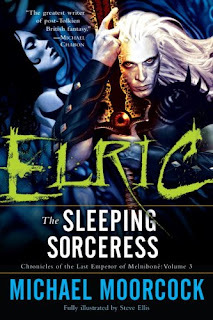 The second contest has another interesting series as a prize, Michael Moorcock's Chronicles of the Last Emperor of Melniboné, comprised of "Elric: The Stealer of Souls", "Elric: To Rescue Tanelorn" and "Elric: The Sleeping Sorceress". The members of Book Spot Central (the former Fantasy Book Spot) have the opportunity to win some interesting prizes. First two lucky winners, one grand prize winner and one second place winner, can win a copy of Archer and Armstrong: First Impressions, a recently released hardcover from VALIANT Entertainment collecting issues#0-6 of by Jim Shooter and the legendary Barry Windsor-Smith. But, the Grand Prize winner will win a copy of First Impressions and a limited X-O Manowar Lithograph. 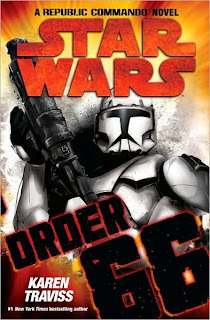 On the second contest one lucky winner will receive a copy of the novel "Star Wars: Order 66" by Karen Traviss. 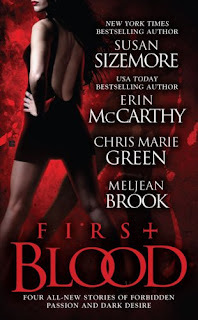 Last, but not least Paul at Blood of the Muse has paperback copy of "First Blood" featuring four short tales by bestselling authors Chris Marie Green, Susan Sizemore, Erin McCarthy and Meljean Brook. The prize is even more attractive because it is signed by Chris Marie Green. 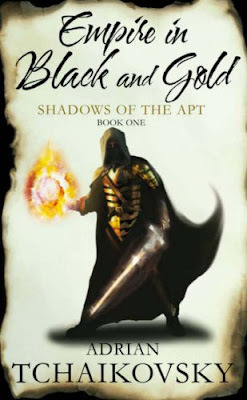 "Empire in Black and Gold"
“Empire in Black and Gold” is the debut novel of Adrian Tchaikovsky and the first novel in the “Shadows of the Apt” series. The Wasp-kinden managed to gather his scarce tribes under one ruler and after that they started to build their empire. City after city and region after region felt under the Empire armies. Stenwold Maker, a beetle-kinden artificer, witnessed the fall of the city of Myna and that event changed his life. After 17 years, period in which Stenwold tried to warn his compatriots about the threat of Wasp Empire, he must act together with his protégées, Che, Tynisa, Salma and Totho. All of them go to the Lowlands in a final attempt to warn the cities of Lowlands about the imminent invasion of the Wasps. Adrian Tchaikovsky might not bring something new to a basic idea used in fantasy stories. That idea, one or more teenagers change their course of life in a dire and grim time, seems ageless and it might work her magic if used properly. But Adrian Tchaikovsky not only that uses this particular idea but he gives it a unique touch through his world-building. The author creates a very interesting world where the main inhabitants are humans, but they are not mere humans. The humans that inhabit Tchaikovsky’s world developed some characteristics from a particular insect. Therefore here the human race is divided in different kinden, the notion behind their unique characteristics drawn from a specific insect. I really loved meeting the Wasp-kinden, the Ant-kinden, the Beetle-kinden, the Mantis-kinden, the Spider-kinden and the Moth-kinden. And beside this races that come in focus I see glimpses of others kinden too and I hope that they will be further developed in the upcoming novels of the series. Like I said every human in “Empire in Black and Gold” developed a particular characteristic based on the ability of an insect. And like I said I really liked this particular idea, but it is not the only thing that I liked on Adrian Tchaikovsky’s novel. 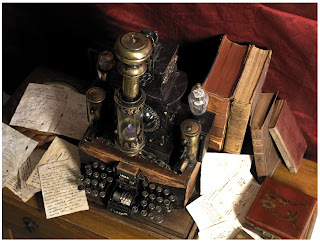 Another aspect that I liked was the presence of different gadgets and technology in the story. The Beetle-kinden developed ability for building different machines and objects and the humans of this particular race may become master artificers. So I could see flying machines, trains and automatons and their presence add to the unique touch of the author on the story. I know that the majority of fantasy novels don’t benefit from the presence of technology, but in this case Adrian Tchaikovsky makes a good and enjoyable mix between a medieval looking world and the presence of technology. The story is told through the different points of view. We have a great number of characters that relate the events in their lives. Because of this fact many of them will lack an in depth development, but despite of this shortcoming the author manages to make his characters enjoyable and entertaining. So even though I wasn’t drawn toward every single character I liked reading about some of them and I was attracted toward the stories of Tisamon, Achaeos, Salma and Thalric. And I will wait with pleasure to read about their future adventures. “Empire in Black and Gold” is not entirely without flaws. The novel shows glimpses on the history of this world and I could read some references on a revolution that changed this world. However these ideas are not developed and I will certainly have liked to see them more developed. Also the humans use the Art, a method which helps them reach the characteristics of their insect kinden. I would have liked to learn more about the Art too, but this idea is also under-developed and not fully explained by the author. The rhythm of the story may slow down sometimes and the pace decreases, but it doesn’t bothered me too much. However I easily overcome all these weak points and I really enjoyed the novel and with certainty I will read the next novels of the series. Adrian Tchaikovsky made a unique imprint through his debut novel “Empire in Black and Gold” and his novel adds a unique flavor on the fantasy genre. Through the courtesy of the very nice Angela Taratuta I benefit of a new avatar. 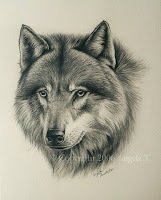 Angela was very kind and allowed me to use her “Wolf Portrait” which she crafted with her wonderful talent. You can find out more about Angela Taratuta by visiting her website, The Book Path, or by visiting her gallery hosted on DeviantArt. Fantasy Book Critic - Robert does an absolutely lovely job at his blog and although his time limits his reviews now he is backed up by a wonderful team. He helped me a lot when I started my blog and his work is a source of inspiration. The Book Swede - Chris is a wonderful reviewer and his blog provides a lot of interesting reviews, interviews and giveaways. Unfotunately he passes through a difficult period in his life, but I am totally next to him in his tough times. 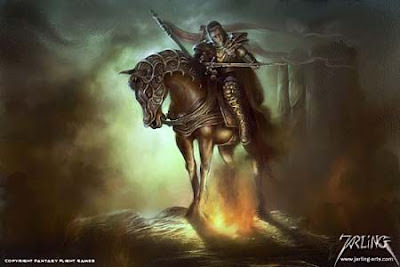 OF Blog of the Fallen - Larry is a constant blogger, with wonderful forays in the world of speculative fiction and with a spotlight on the Spanish language writers, but not only them. 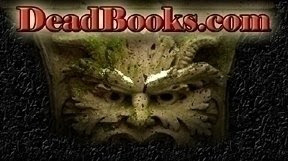 Fantasy Book News & Reviews - Jeff has a wonderful blog, a very interesting and original style of reviewing and a great index of reviews, which if I'm not mistaken reached 800th review link. The Bodhisattva - Jay posts pretty much about his wonderful work that he makes on Book Spot Central, but that doesn't mean that we can't find wonderful reviews and interviews and very attractive contests. 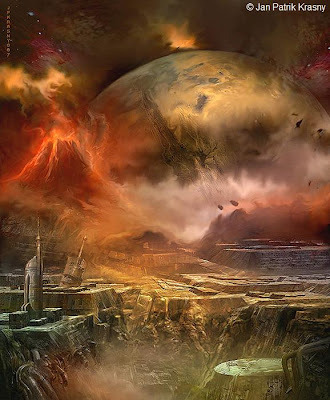 Cititor SF (it means SF Reader) - Kyodnb and Aspoiu provide useful information about the Romanian market of Fantasy and SF and a great range of reviews of the respective titles. A wonderful blog in a pretty much restricted area in Romania. Insemnari din coltu' hartii (Notes from the corner of the map) - Horia runs a small publishing house, Millennium Press (with great potential and a bright future), and his personal blog. Here I can find absolutely lovely forays in the work of a publisher, information about the upcoming titles of Millennium Press and the opportunity to see some wonderful writers in Romania, through their works or in person. He was one of Jeff VanderMeer's guests on his blog Ecstatic Days.